Millie's Mann recorded an impressive victory at Ararat in a 1300 metre Showcase BM70 race last Friday 19/09/14 breaking the track record. She was given a lovely run in the race by jockey Damian Lane. She is a lovely honest little mare that tries her hardest. 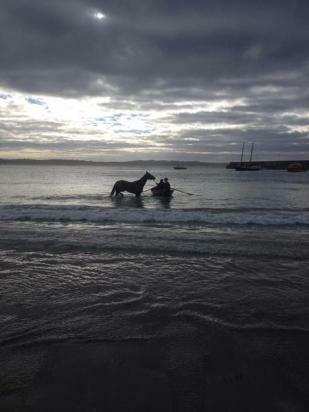 This photo was taken the morning after the race of Millie's Mann enjoying her swim at the Warrnambool beach.